Hello Disney and Crafty Friends! It is cold and rainy here in the desert today. With this weather it feels like Christmas should be coming and not over with. The fact that my Christmas tree and decorations are still up could be adding to the festive spirit in my mind. 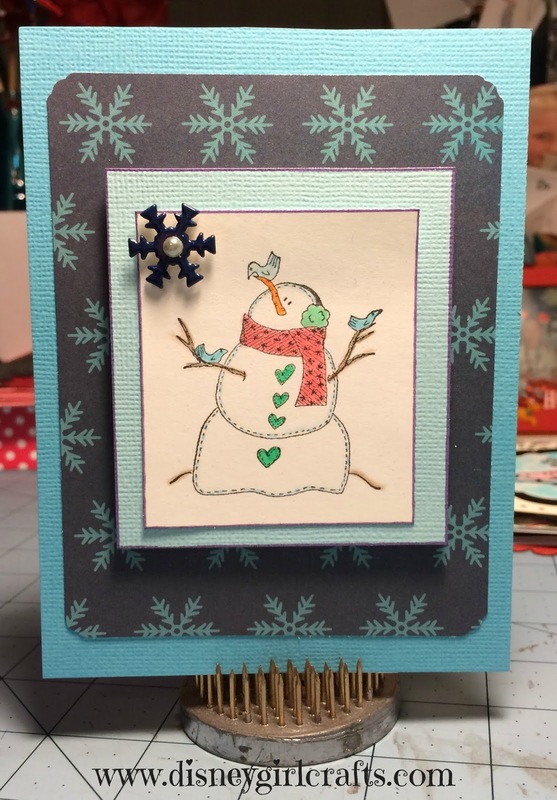 In December Scrapbook Blessings Club teamed up with Scrapping For Less to bring you an awesome card kit. I had my card made well in advance but never posted it. Sad fact, but very true. I had the best of intentions and dropped the ball. So.....once again, that makes me late to the party so to speak. To see the kit that was offered head on over here. I am not sure if there are any kits left for purchase but if you are interested in purchasing one do not hesitate to ask. The card that I made is pictured at left. I hope that you are off to a wonderful start for the New Year. Thanks so much for stopping by! Have a magical day! Love your card Brenda! The dimension you created just adds to the cuteness of it! My philosophy: it is never too late to share a cute card. Adorable card and the snowman image is super cute. Such a cute card. Love how you put it all together. Great job on the coloring. Happy New Year Brenda. Hope it's great!